Godzilla is a giant dinosaur-like fictional monster who first appeared in movies from Japan, in the year 1954. Since then has been featured in twenty-nine movies. During his movie career, this large reptile fought against many other mythical monsters, including the giant moth-like Mothra, the three-headed King Ghidorah, his own robotic mirror image Mechagodzilla, and several more enemies. The original Japanese name, Gojira orゴジラ, is a combination of the words gorilla and kujira (means whale). 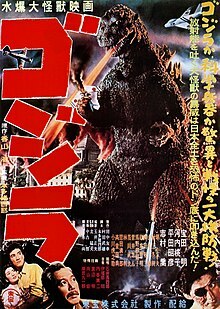 In countries where the primary language is English, the name has been changed to Godzilla. This page was last changed on 19 September 2018, at 10:40.